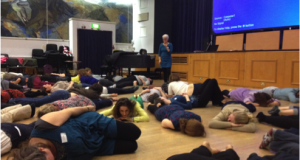 We’re pleased to announce we have published some footage capturing highlights of the Born to Sing and Dance conference held in March 2014 by Sound Connections and the London Early Years Music Network (LEYMN). The keynote speech given by Professor Emeritus Colwyn Trevarthen. We apologise that the audio on the keynote film is poor quality, so we’ve added subtitles for you to plug in your headphones and follow along to! These films have been produced by Wired4Music member Ackeem Durrant. As a follow up to the fantastic comments about the importance of practitioners meeting regularly to share practice and ideas, we’re launching the first of our Teachmeet-style Play Date: ‘Not Wheels on the Bus Again – New Repertoire and Exciting Ways to Use It!’ – a new approach to professional development for LEYMN members. Join us for an interactive session of networking, music-making, sharing of knowledge and practice, and eating! LEYMN core member Sue Nicholls will lead us in exploring new repertoire and how to bring new life to those songs we use time and time again. We’re looking for you to book onto the event as either mini inspirer (to share your own take on unique and dynamic ways to deliver new repertoire for no more than 7 minutes), nano inspirer (to share a thought, new idea or suggestion for no more than 2 minutes), or enthusiastic audience members (who will listen and take part in general discussions and sharings). The idea is to bring along an intellectual offering however big or small to spark a flow of ideas and discussion – get the creative ball rolling, so to speak. Join us on Tuesday 14 October from 5-7pm for the first of these free innovative networking events designed specifically for early years music practitioners.